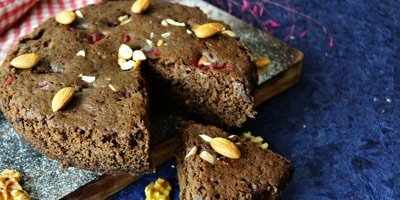 Microwave cake recipe: how to make microwave cake without egg and using wholewheat flour or atta. This microwave cake recipe will also have curd and no oil/ butter. Sieve granulated sugar and coco powder. Mix it well. Beat the mixture for 2 – 3 minutes with the help of beater or hand whisker. Sieve wholewheat flour in the same bowl and mix it. Now add milk, glycerine, vanilla essence, instant coffee, baking powder and baking soda and mix it well. Now beat the mixture for ½ to 1 minute. Add 1 -2 tablespoon of water, if required. (The batter should be of medium consistency.) Mix it. Add chopped dryfruits of your choice. Pour the batter into a greased and dusted (sprinkle some amount of flour) microwave bowl. Tap the bowl to remove any air. Add dry fruits and cherries on top.